Happy (Almost) Valentine’s Day to my reader friends! To help celebrate the romantic nature of the upcoming holiday, I’ve rounded up a list of some of the romantic stories I’ve been wanting to read. A few of these are being released this month, while others have been patiently waiting on my to be read list for a while. So… which should I read next? Decisions, decisions! The Mail Order Brides Collection by Kathleen Y’Baro, Megan Besing, Noelle Marchand, Donna Schlachter, Michelle Schocklee, Sherri Shackelford, Ann Shorey, Liz Tolsma, and Jennifer Uhlarik. Are there any romances you’ve particularly enjoyed or have been wanting to read? Please share in the comments. 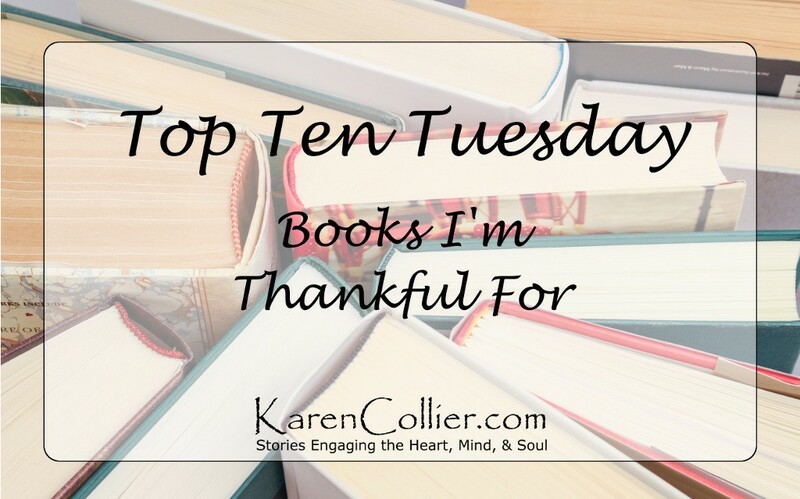 Or to check out more Romance themed Top Ten Tuesday posts from other bloggers around the Web, check out the linkup at That Artsy Reader Girl. I’m always on the lookout for a good audiobook to pass the time on my commute to and from work. I’ve tracked down a dozen new releases, coming this fall that sound like they could be just what I’m looking for. So, which titles look good to you? 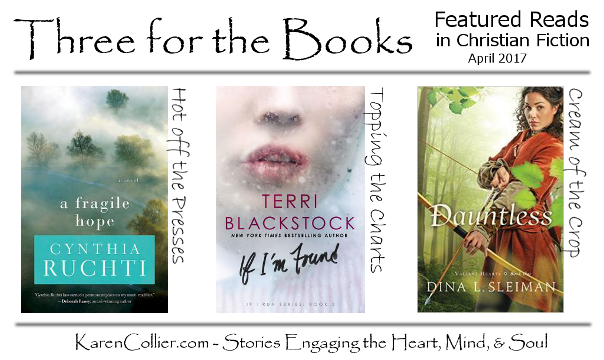 The monthly “Three for the Books” post is where I feature new (Hot Off the Presses), best selling (Topping the Charts), and award winning (Cream of the Crop) Christian fiction books. I select one title to feature in each category and provide links to where you can browse additional newly released, best selling, and award winning titles. For my featured reads, I’m also including links to some fabulous reviews by fellow bloggers, so you can check out what others are saying. Have you read any of these featured titles? Any others you’d like to give a shout-out? Comments are always welcome! A Fragile Hope by Cynthia Ruchti is a new contemporary release this month from Abingdon Press. It’s available in print and electronic editions. Featured Review: Jen at the Mother of Three blog says, “Ruchti doesn’t shy away from tackling the hard stuff of life and never fails to weave gospel grace into her stories.” Check out her full review of A Fragile Hope here. If I’m Found by Terri Blackstock appears on the ECPA bestsellers list for April. This suspense novel is second in a series that’s told in the first person (following If I Run), and is available from Zondervan in print, electronic, and audio formats. Featured Review: The blogger at Fiction Aficionado reviewed this novel, saying, “Really and truly, if you love suspense, this series should be on your ‘must read’ list. I’ll be counting down the months, weeks, and days until the final book releases!” Click to read more of this review of If I’m Found here. Dauntless by Dina L Sleiman won the Carol Award in the YA category for 2016. This reimagining of the Robin Hood legend is available from Bethany House in print and electronic editions. Featured Review: Over at the Straight Off the Page blog, Marisa wrote, “Sleiman created a world of both magic and reality within the confines of medieval England that brings readers into the hearts of teenagers and the world of adults. With a gripping tangle of faith, friendships, romance, and survival, Dauntless should be on everyone’s to-be-read list regardless of the reader’s age.” You can find her full review of Dauntless here. Welcome to the April 2017 edition of the Christian Fiction Book Club Connection. Thanks for stopping by! Whether you’re a pastor or ministry leader thinking of forming a book discussion group at your church, a current member of a book club, or simply a fan of Christian fiction hoping to connect with other readers, you’re in the right place. Please consider subscribing to my blog so you won’t miss future posts. The ACFW Book Club‘s April selection is to be determined. You can subscribe to the group’s e-mail list now, by following the instructions on their Web site, to be sure not to miss any announcements or discussion questions. By the Book is an in-person book discussion club that has introduced an online Facebook-based discussion option. To join in online, like the By the Book Facebook page, and be sure to check back there periodically for any discussion that may not have made it into your news feed. April’s selection is The Long Highway Home by Elizabeth Musser. For April, the Christian Fiction Devourers group on Goodreads is discussing Wildflowers from Winter by Katie Ganshert AND Land of Silence by Tessa Afshar. Grab your copies and head on over to the discussion forum to check in with others who are in the midst of reading these books. The Fans of Amish Fiction Goodreads group discusses one Amish fiction title per month. The selection for April is The Atonement by Beverly Lewis. To join in, visit the group’s online discussion board. Jamie of the Books and Beverages blog hosts a monthly Inklings discussion series for fans of J.R.R. Tolkien and C.S. Lewis. Sometimes fiction, sometimes non-fiction, the title for the month of April is The Problem of Pain by C. S. Lewis. The discussion is planned for April 20, 2017. 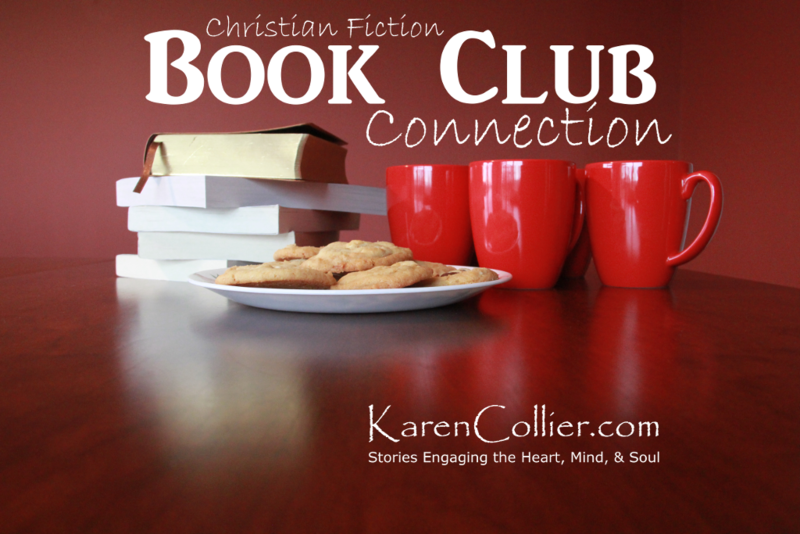 Welcome to the June 2016 edition of the Christian Fiction Book Club Connection. Thanks for stopping by! Whether you’re a pastor or ministry leader thinking of forming a book discussion group at your church, a current member of a book club, or simply a fan of Christian fiction hoping to connect with other readers, you’re in the right place. Please consider subscribing to my blog so you won’t miss future posts. The ACFW Book Club‘s June selection is Sit, Stay Love by Dana Mentink. You can subscribe to the group’s e-mail list now, by following the instructions on their Web site, to be sure not to miss any announcements or discussion questions. For June, the Christian Fiction Devourers group on Goodreads is discussing Mist of Midnight by Sandra Byrd AND Until the Dawn by Elizabeth Camden. Grab your copies and head on over to the discussion forum to check in with others who are in the midst of reading these books. The Christian Book Lovers’ Hideaway group’s monthly discussions can be found on their Goodreads discussion page. Their June fiction selection is Five Days in Skye by Carla Laureano. The Fans of Amish Fiction Goodreads group discusses one Amish fiction title and one Christian fiction title per month. The selections for June are Heart in Hand by Barbara Cameron AND Saving Amelie by Cathy Gohlke. To join in, visit the group’s online discussion board. Jamie of the Books and Beverages blog hosts a monthly Inklings discussion series for fans of J.R.R. Tolkien and C.S. Lewis. Sometimes fiction, sometimes non-fiction, the title for the month of June is The Abolition of Man by C.S. Lewis. Discussion is scheduled for June 15, 2016. The Christian Fiction Book Club, and the Fans of Christian Romance Goodreads group are taking breaks from discussion for the time being. As the weeks and months pass, they discover finding each other was easy, but holding on will be a different story. Come to Me Alive is a sweet, contemporary Christian romance between a school teacher and a formerly “bad boy” country music star. The story focuses primarily on their developing relationship from a cleverly amusing cute meet involving an attacking duck, through some relational rough patches, right on to a satisfying ending. Secondary plot threads involve dealing with challenges balancing career, faith, and fatherhood, as well as reconnecting with estranged family. I thought the author did a great job introducing the reader to her characters and showing just how they fall in love a bit at a time. It felt very true to life. Maybe even a little too much so, in that the conflicts standing between them and a happy ending weren’t all that evident until much later in the book. The smooth sailing early on gave me pause, but I am glad I stuck with the book because the story becomes deeper and more meaningful as it goes on. There were plenty of descriptive details throughout, to show the reader exactly what’s happening at any given time. I’ll admit, there were a few instances where I thought the description may have gone a bit overboard, delving into nitty-gritty minutiae like the process of writing a check and what shape that check was, but nit-picking aside I’d rather have too clear a picture than too vague. The hero’s newness to his Christian faith offered plenty of opportunity to showcase some of the ways that faith can change lives. Overall, this is a fun and leisurely read for anyone who enjoys the process of falling in love. And really, who doesn’t? I had the pleasure of listening to the audiobook edition, which has been honored with a nomination for one of this year’s Audie awards. The narrator and those involved in production went above and beyond the call of duty. The audio includes a recording of the song that plays a big role in the story. In fact, I’m told that song was arranged and produced specifically for the audiobook. How cool is that, right? At another point, when a character quotes a literary classic in Middle English, the narrator does a convincing job with the accent/pronunciation, all while staying within that character’s voice. Oh, and while children’s voices tend to challenge narrators, the little girl’s voice in this story has a sweet and innocent quality to it that seems quite natural to the character. Overall, an excellent narration that I’d highly recommend to any audiobook fans who enjoy this genre. Thank you to the narrator for providing a complimentary copy of the audiobook for review purposes. Welcome to the May 2016 edition of the Christian Fiction Book Club Connection. Thanks for stopping by! Whether you’re a pastor or ministry leader thinking of forming a book discussion group at your church, a current member of a book club, or simply a fan of Christian fiction hoping to connect with other readers, you’re in the right place. Please consider subscribing to my blog so you won’t miss future posts. The ACFW Book Club‘s May selection is Fatal Reunion by Jessica R. Patch. You can subscribe to the group’s e-mail list now, by following the instructions on their Web site, to be sure not to miss any announcements or discussion questions. For May, the Christian Fiction Devourers group on Goodreads is discussing Edenbrooke by Julianne Donaldson AND The Air We Breathe by Christa Parrish. Grab your copies and head on over to the discussion forum to check in with others who are in the midst of reading these books. The Christian Book Lovers’ Hideaway group’s monthly discussions can be found on their Goodreads discussion page. Their May fiction selection is Once Upon a Prince by Rachel Hauck. The Fans of Amish Fiction Goodreads group discusses one Amish fiction title and one Christian fiction title per month. The selections for May are If I Run by Terri Blackstock AND The Forgotten Recipe by Amy Clipston. To join in, visit the group’s online discussion board. Jamie of the Books and Beverages blog hosts a monthly Inklings discussion series for fans of J.R.R. Tolkien and C.S. Lewis. Sometimes fiction, sometimes non-fiction, the title for the month of May is The Silver Chair by C.S. Lewis. Discussion is scheduled for May 18, 2016. Oath of the Brotherhood is the first book in C.E. Laureano’s The Song of Seare fantasy trilogy. Featuring relatable characters, dire circumstances to challenge those characters, and a vividly described storyworld with a mediaeval Celtic feel, this book does a great job drawing readers in to the series. Conor and Aine make likeable leads. Clearly their hearts are in the right place, but we get to see a lot of character growth over the course of this book, and I look forward to seeing where the rest of the series will take them. Romance readers will enjoy the way Conor and Aine are drawn together even when separated by circumstance, and adventure fans will appreciate the story’s suspenseful backdrop of good vs. evil magic and of clan warfare. Both Conor and Aine grapple with waiting for God’s timing (He’s referred to as Comdiu in this allegory), and preparing themselves to use their talents when called to do so. A large portion of this book is devoted to exploring Conor’s training with the Fíréin brotherhood in music and military skills, which sounds like it could be boring, but which I actually found to be quite fascinating. I thought the Celtic-sounding names for people and places were a nice touch, lending authenticity to the storyworld. Unfortunately, I didn’t discover the glossary and pronunciation guide at the back of the book until I had finished reading it. Oops! Never would’ve guessed “Eoghan” sounds like “OH-in” or that “bean-sidhe” sounds like “BAN-shee,” although those pronunciations do make so much more sense than what I was saying in my head. LOL! I’ll be sure to consult the glossary as I read the next book so I can get those names right. For anyone else just starting to read this series, you’ll be happy to know that you won’t have to wait for Books 2 and 3. Beneath the Forsaken City and The Sword and the Song are both available now, so you’ll be able to read the trilogy in its entirety with nary a pause between books if you wish. Thank you to Tyndale House for providing a complimentary copy of this book for review purposes. Welcome to the March 2016 edition of the Christian Fiction Book Club Connection. Thanks for stopping by! Whether you’re a pastor or ministry leader thinking of forming a book discussion group at your church, a current member of a book club, or simply a fan of Christian fiction hoping to connect with other readers, you’re in the right place. Please consider subscribing to my blog so you won’t miss future posts. The ACFW Book Club‘s March selection is Finding Amanda by Robin Patchen. You can subscribe to the group’s e-mail list now, by following the instructions on their Web site, to be sure not to miss any announcements or discussion questions. For March, the Christian Fiction Devourers group on Goodreads is discussing A Sound Among the Trees by Susan Meissner AND When Love Calls by Lorna Seilstad. Grab your copies and head on over to the discussion forum to check in with others who are in the midst of reading these books. The Christian Book Lovers’ Hideaway group’s monthly discussions can be found on their Goodreads discussion page. They’ve extended their discussion of their February selection through March, so if you didn’t have a chance to read The Cross Examination of Oliver Finney by Randy Singer yet, there’s still time. The Fans of Amish Fiction Goodreads group discusses one Amish fiction title and one Christian fiction title per month. The selections for March are A Widow’s Hope by Mary Ellis AND Tomorrow’s Sun by Becky Melby. To join in, visit the group’s online discussion board. Jamie of the Books and Beverages blog hosts a monthly Inklings discussion series for fans of J.R.R. Tolkien and C.S. Lewis. Sometimes fiction, sometimes non-fiction, the title for the month of March is A Hobbit, a Wardrobe, and a Great War by Joseph Loconte. Discussion is scheduled for March 16, 2016.